The trial access to Bankscope is now available until 21 April 2014. Bankscope is a comprehensive, global database of banks’ financial statements, ratings and intelligence. It combines comprehensive data with flexible software for searching and analysing banks. It contains detailed financial information for top public and private European, North American, Japanese, Russian and other major banks. Please note that during the trial access the data from Bankscope can only be displayed and cannot be downloaded. When you have tried Bankscope, please click and accomplish this Online Feedback Form (indicate Bankscope in the 'Name of online article/journal/ebook database and/or tool' field). Your feedback/recommendations/comments will truly be helpful in deciding whether or not the Library shall subscribe to this database. We are pleased to announce to the community that SciFinder is now available in and off campus. SciFinder provides easy access to the world’s largest and most comprehensive collection of chemistry-related information. It supports research with intellectually analyzed content and tools from the highest quality and most timely scientific information source. SciFinder has an alert service that notifies you of new information on the topics or substances of your choice. You will stay on top of new scientific breakthroughs with SciFinder as the CAS databases are updated daily with 12,000-15,000 substances and more than 3,000 references. A one-time registration using a MyLasalle email account, i.e. username@dlsu.edu.ph, is required before you can access the database. Please visit the Library's homepage at http://www.dlsu.edu.ph/library to create your registration details (see ‘Click here to register’) and confirm through email. You may access SciFinder thereafter (see ‘Click here to Login’). 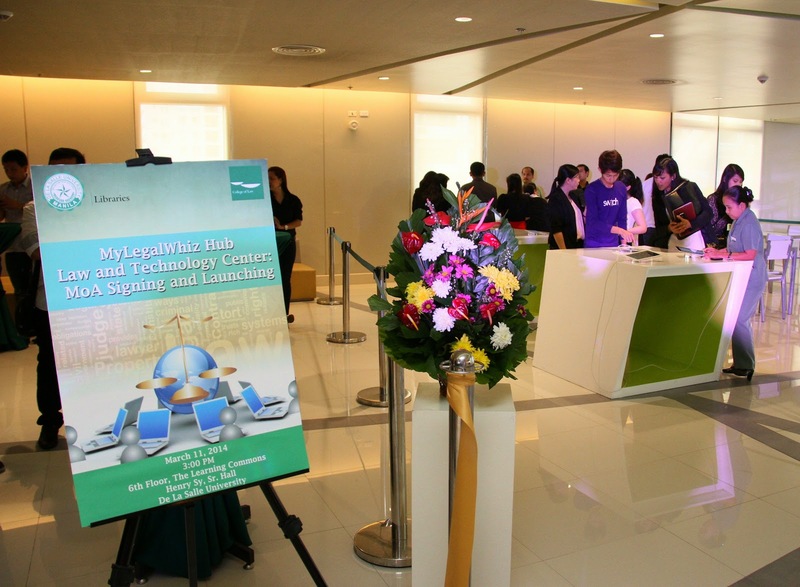 The date 11 March 2014 marked the launching of the first law and technology hub in the Philippines, the MyLegalWhiz Hub, Law and Technology Center, at the 6/F, The Learning Commons, Henry Sy, Sr. Hall, De La Salle University-Manila. The memorandum of agreement (MoA) between DLSU-Manila and Thinc Office Corp. was signed by Br. Ricardo P. Laguda FSC, President and Chancellor of DLSU-Manila and Atty. Joseph Dexter M. Feliciano, Founder and CEO of Thinc Office Corp. Dr. Myrna S. Austria, Vice Chancellor for Academics; Mr. Edwin P. Santiago, Vice President for Administration; Dr. Leonila C. Abella, Associate Vice President for Information Resource Management; Atty. Jose Manuel I. Diokno, Dean, College of Law; and, Atty. Jocelyn P. Cruz, Vice Dean, College of Law, also signed as witnesses. The signing of the MoA seals the partnership of DLSU and Thinc Office Corp. on the establishment of a law and technology hub that will host the latest technologies in legal research and introduce cloud-based service that can revolutionize legal study and practice in the Philippines. Thinc Corp. together with its partners Acer Philippines and Switch (Apple) provided the latest computers and mobile devices and relevant technology required by this hub. Thinc’s software, MyLegalWhiz, a dynamic and innovative cloud-based technology that provides an extensive yet organized and curated legal research information and knowledge, powers each computer device for legal research. As it aims to be a symbol of innovation in law in the Philippines, the hub will showcase the latest technological developments (both in hardware and software) that can make law students, practitioners and educators efficient in their research, study and work. It will also serve other colleges by providing new research technology and content on intellectual property, taxes, government compliance, among others. The MyLegalWhiz Hub, Law and Technology Center is located beside the Cyber Nook, 6/F, The Learning Commons, Henry Sy, Sr. Hall. The National Commission for Culture and the Arts (NCCA) held the oath-taking ceremony and orientation for all officers and members of the six (6) National Committees under the Subcommission on Cultural Heritage (SCH) last March 6, 2014 at the Kachina Room, Century Park Hotel. The six National Committees include National Committee on Archives (NCA), National Committee on Art Galleries (NCAG), National Committee on Historical Research (NCHR), National Committee on Library and Information Science (NCLIS), National Committee on Monuments and Sites (NCMS) and the National Committee on Museums (NCM). Ms. Karen Natividad, the Coordinator of the Archives of the Libraries, is the academic archives representative of the Executive Council of the NCA. She took her formal oath of office on the said event. A general orientation on NCCA was also held, after which was the break-out by committees where committee rules, regulations and concerns were discussed. K. Natividad will serve as Executive Council member of the NCA from 2014 to 2016. Vote for your 2013 Library Customers' Choice! 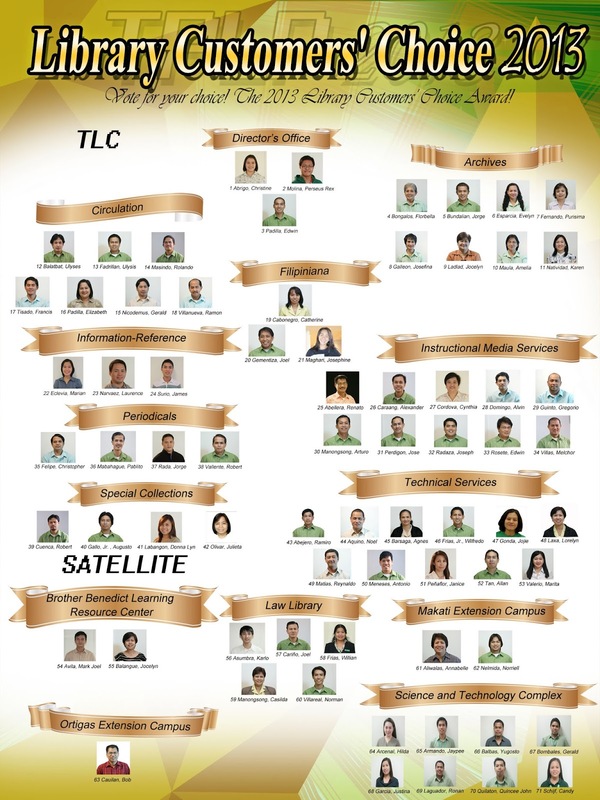 The Libraries' Top Performing Library Personnel (TPLP) Committee is now on its search for the 2013 Library Customers' Choice Awardee. The TPLP is an "annual tradition of the Libraries to recognize its employees that have rendered exemplary service to the academic community". Since the TPLP was postponed last December 2013, the winners will be awarded during the 2014 Library Planning/Workshop. Voting ends on March 15, 2014. Thank you.